Editors’ note: in late July we posted an entry (‘Decolonising our universities: another world is desirable‘) that profiled a conference statement reflecting significant unease regarding the dominance of the ‘Western’ model of higher education, including the university. A few weeks later, Ben Wildavsky posted a response (‘Academic Colonialism, False Consciousness, and the Western University Ideal‘). In our minds both contributions include valid points, but they both contain a significant number of generalizations: lines are drawn, and nuance and shades of grey are missing — a point one of us (Kris Olds) also made in a mid-August dialogue via Twitter with Ben Wildavsky, though Ben obviously disagreed! Is the concept and the definition of internationalization keeping up with developments in higher education? Is there a shared understanding of the concept? Has internationalization lost sight of its central purposes? IAU is posing these and other questions in a reflection directly in line with the findings of the 3rd Global Survey on Internationalization. The Survey clearly points out the differences in why internationalization is pursued in different parts of the world and how it impacts on various institutions in vastly diverse contexts. Furthermore, this initiative is a natural sequel to past normative efforts of the Association, such as the Policy Statement and Declaration and Checklist for Good Practice. The Ad hoc international Expert Group was created to bring together perspectives from all parts of the world inter alia to: assess the extent to which internationalization activities fit the current conceptual umbrella, to critically examine the causes that are leading to some questioning and even criticism of the concept and to investigate the ways to address these concerns. We’d like to thank both C.K. Raju and Ben Wildavsky for engaging in this debate. We also look forward to insights that might be generated by the IAU’s initiative on Re-thinking Internationalization. ps: please note that there are endnotes in the response below. In his comments1 on the Penang conference on “Decolonising our universities”.2 Wildavsky suggests that the conference produced only silly rhetoric and complaints. Such deprecatory attitudes are commonplace,3 hence a systematic result of Western education. That takes us to the roots of the differences between the Western university model and the non-Western models of higher learning. Those alternative models are provided, for example, by the historic Indian university of Nalanda (-5th c. CE, with international students even from China), or the Baghdad Bayt-al-Hikma (early 9th c. CE), which model spread throughout the Islamic world, including the Caliphate of Cordoba, and Toledo in Europe. The Western university system started in Crusading times in Bologna (late 11th c. CE), shortly after the fall of Toledo brought its vast library under Christian control. (The exact “official” church start date for the Crusades is irrelevant, as pointed out in my paper presented at the conference.4) That is, the Western university system originated in a change in church policy towards non-Christian books, from burning them to learning from them. This change of policy was justified by pretending that the imported knowledge—both its origin and content—were theologically correct. The fantastic claim was advanced that the secular knowledge in those Arabic books was all due to (theologically correct) early “Greeks”. This was intended to belittle the contributions of Muslims, black Egyptians, and others to that world knowledge. During the Inquisition, which followed, Europeans never dared acknowledge non-Christian sources and Western historians helped pass it all off as their own original ideas, as in the cases of Copernicus and Ibn Shatir, or Newton and calculus.5 This cumulative false history was later used by Hume, Kant6 and many others to justify racism. The “soft power” of that false history was amplified by Macaulay who used it to impose Western education (and the related indoctrination), and thus establish colonialism.7 The content of the imported non-Western knowledge was made theologically correct through reinterpretation (and by modifying the Christian doctrine to Christian rational theology, a modification8 of Islamic rational theology). This paternal link between the church and the Western university persisted for centuries, with the church being the key consumer of the students produced by the university. The industrial revolution weakened the link, but did not sever it. In the middle of the 20th c., Harvard, Princeton, and Yale refused to keep Isaac Newton’s long-suppressed papers9 in their library, since he had detailed how the church had distorted the Bible. Even as late as 2003, after the secret was out, the Cambridge Newton scholar, Whiteside, tried to hang on to that falsehood by abusing me10 for pointing to that “cartload” of Newton’s suppressed papers. Scholars from Harvard are still defending those fairy tales about Greek achievements and the Copernican and Newtonian revolution. In short, for much of its 900 years of existence, the Western university served a propagandist function, like the students it produced, and that tendency still persists. The aim, like that of the church, was to train students to persuade others, by any means, including false history. In contrast, in each of the above mentioned non-Western higher-learning models, students tried to convince themselves, for they were seeking truth, or wisdom, or the right way to live, so unethical tricks had no place at all. This difference between the two models is also reflected in the processes of validating knowledge. In the West it is a hush-hush process: the “merit” of a Western academic is judged by papers published in journals where referees will review it in secret. Though this secretive process is touted as allowing referees greater freedom to criticise someone in authority, the process is widely used and perhaps intended to suppress those not in authority. It strongly resembles the system of censorship designed by the church to preserve its authority. Those critics who escaped the censor where suppressed by branding them “heretics”, just as critics, especially non-Westerners, are easily labelled as “cranks” today, for challenging Western authority, no arguments needed. That is especially so in hard sciences, where the majority of the Western educated are illiterate, and must rely on the guidance of authority to decide truth. (And scientists are forced to specialise, hence still depend upon authority to decide truth.) This “criterion of reputability” (as distinct from “refutability”) helped the church to sustain egregiously bad beliefs, like the date of creation set at 9 a.m. On 23 October 4004 BC by the Vice Chancellor of Cambridge. This procedure is of little value, if the aim is truth. The authority to decide “reputability” is today exercised by editors who secretively appoint referees. So, our faith in that system of validating knowledge rests largely on our faith in the honesty of editors and referees of scholarly journals. Some editors and referees surely are honest, but all certainly are not. Objective claims about this system of validation are impossible (either way), since it is secretive, and has never been studied. “Horror stories” abound. For example, when credit for my work,11 called a paradigm shift in physics, was given to a former President of the Royal Society, by naming it after him,12 in consultation with him,13 and well after he was personally informed14 of my work, the editor of the American Mathematical Society just published some post-facto references to my work,15 and refused to permit me to bring out the fact that this was the second attempt. He stuck to the decision, despite a petition by many academics that I should have a right to reply. If this is what happens in full public view, one shudders at the thought of what happens under cover of secrecy. In contrast, the transparent process of validating knowledge in India was one of public debate. So seriously were these debates taken, that a pundit (Mandana Misra) who had decided to die, and had buried himself up to his neck, waited before dying, in that condition, to complete the debate to which he was challenged. There were certain rules for settling debates. Ignorance or misrepresentation of the opponent’s position (purva paksha) meant the debate was lost. 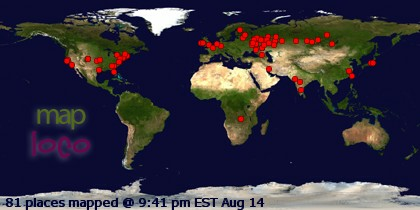 Wildavsky should note. A refusal to ape the West is commonly misrepresented as an uncritical rejection! However, the consensus at the decolonisation conference was that, though Western universities have widely rejected non-Western knowledge as lacking contemporary significance,16 our rejection of the West would be a critical one. So what would this critical rejection consist of? My own paper concerned hard sciences which helped to establish colonisation, and which remain the carrot today for Western education.17 As I explicitly stated, the aim was not to complain, as Wildavsky wrongly maintains, but to outline an alternative curriculum in (a) math, (b) science, and (c) the history and philosophy of science. The influence of the church on Western universities has led to the intrusion of Christian theology even into mathematics and science, which must be eliminated together with false history. To summarise, the following changes were proposed. (1) Eliminate the falsehoods in Western history. (2) Eliminate the religious bias in formal math and (3) in physics, by teaching calculus without limits and functional differential equations, respectively. Naturally, I also pointed to the dimension of hegemony. Referring these changes to Western-endorsed experts would raise a conflict of interests, for their lifetime accumulation of academic “merit” might vanish overnight if they agreed to the changes. So, there must be a change in the process, not merely the particulars of the curriculum. Hence, for these proposed curriculum changes to be successfully implemented, a fourth change is first needed. (4) A new model of validating knowledge, by eliminating the bad technique of reliance on the opinions of Western-endorsed experts articulated in secret. That technique encourages subservience to the West; if these “experts” have anything to say, they should debate it publicly. Instead of papers published, through a secretive process, I have proposed to measure academic merit by public debate and the demonstrable benefits to the community. This would expose the coopted colonised elite. The West might impose its educational model on client governments, but it is amusing to claim, as Wildavsky does, that the Western university model is perfect, so there is no alternative but to ape it. One could more confidently assert the opposite: that the West has little alternative but to implement the recommendations made above. For example, bad math education was one reason for the sub-prime crisis: the managers (from the best Western universities) lacked a personal understanding of the complex math of financial derivatives, and the risks they were taking. The traditional Western route of assimilating non-Western knowledge by attributing it to a Westerner has failed this time! So, it is time for Western universities to openly acknowledge and accept non-Western knowledge if they are not to decline swiftly! 3 See for example, my recent debate in H-Asia, with Witzel, from Harvard, which is archived on my blog, http://ckraju.net/blog/?p=56 and previous entries, and elsewhere on the Internet. Witzel grandly announced that I had made a silly mistake in supposing that early Indian dice were cubic, and explained that this mistake arose due to bad translation. In fact, my paper never mentioned the word “cube” (I spoke of dice with five faces! ), and I did my own translations, and so on. In the absence of a public rejoinder, Witzel’s absurdities would have stood on the reputation of Harvard. The debate also brings out what I regard as the essence of racism: double standards. Thus, Harvard historians use one process to date manuscripts purportedly coming from “Greeks”, and another for Indian manuscripts. 6 Immanuel Kant, Observations on the Feeling of the Beautiful and the Sublime, trans. John T. Goldthwait, University of California Press, Berkeley, 1991, pp. 110–1. 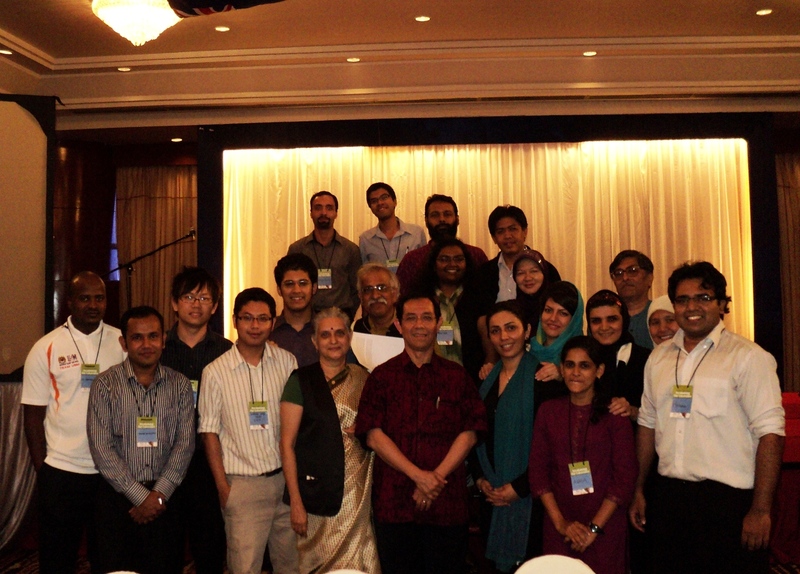 7 C. K. Raju, Ending Academic Imperialism: a Beginning, Citizens International, Penang, 2011. Draft available from http://multiworldindia.org/wp-content/uploads/2010/05/ckr-Tehran-talk-on-academic-imperialism.pdf. 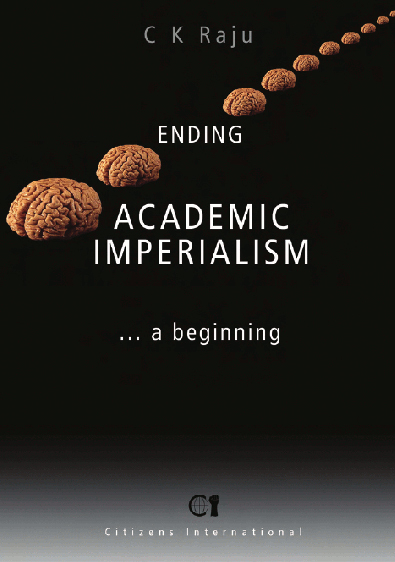 Also, “Ending Academic Imperialism in the Hard Sciences: a Beginning”, chp. 7 in Confronting Academic Knowledge, ed. Sue-San Gahremani Ghajar and Seyyed-Abdolhamid Mirhosseini, Iran University Press, Tehran, 2011. 8 C. K. Raju, “Benedict’s Maledicts”, Indian Journal of Secularism, 10(3) (2006) pp. 79-90. At http://www.zcommunications.org/benedicts-maledicts-by-c-k-raju. Also, “Islam and science”, Indian Journal of Secularism, 15(2), 2011, pp. 14-29. 9 C. K. Raju, “Newton’s secret”, chp. 4 in The Eleven Pictures of Time (Sage, 2003). 10 http://mathforum.org/kb/thread.jspa?threadID=383971&messageID=1184812#1184812 “[HM] Raju’s postings on the topic “Unpublished manuscripts of Newton ?” This post is not part of the main thread at http://mathforum.org/kb/message.jspa?messageID=1184738&tstart=0#reply-tree. Clearly he persisted in trying to suppress the truth about Newton by abusing me. My response was that, on my tradition, resorting to abuse was a sure sign of loss in debate. 11 C. K. Raju, Time: Towards a Consistent Theory (Kluwer, 1994), chp. 5B, http://arxiv.org/pdf/0808.0767v1. The Eleven Pictures of Time, cited above. Also, “The electrodynamic 2-body problem and quantum mechanics”, Found. Phys. 34, 2004, pp. 937–62. 12 G. W. Johnson and M. E. Walker , “Sir Michael Atiyah on the Nature of Space”, Notices of the American Mathematical Society, 53(6), 2006, pp. 674-678. Annotated excerpts at: http://ckraju.net/atiyah/Johnson_Walker_excerpt.pdf. 13 See email by M. E. Walker that Atiyah did indeed see the work prior to publication. http://ckraju.net/atiyah/Walker_email.pdf. 15 M. Walker, “Retarded Differential Equations and Quantum Mechanics”. Notices of the American Mathematical Society 54(4), 2007, p. 472. Available at http://www.ams.org/notices/200704/commentary-web.pdf (scroll to the 2nd page). However, the Society for Scientific Values later found a prima facie case against Atiyah, see http://www.scientificvalues.org/cases.html, case no. 2 of 2007, Atiyah-Raju case. 16 Thus, while there are separate departments for studying Indian philosophy, say, it would be difficult to find any reference to that in discussions of the current philosophy of science. See, also, the debate with Witzel, cited above. 17 Ending Academic Imperialism, cited above. 18 Is Science Western in Origin? Multiversity, Penang, 2009. Also available as a Kindle book. 19 E.g. Ram Mohun Roy, see, Ending Academic Imperialism, cited above. 20 C. K. Raju, Cultural Foundations of Mathematics, Pearson Longman, 2007. 22 C. K. Raju, “The curse on ‘cyclic’ time”, chp. 2 in The Eleven Pictures of Time, Sage, 2003. 23 “The Religious Roots of Mathematics”, Theory, Culture & Society 23(1–2) 2006, Spl. Issue ed. Mike Featherstone, Couze Venn, Ryan Bishop, and John Phillips, pp. 95–97. 24 Cultural Foundations of Mathematics, cited above. 25 R. Descartes, The Geometry, trans. D. Eugene and M. L. Latham, Encyclopaedia Britannica, Chicago, 1996, , Book 2, p. 544. 26 C. K. Raju, “The Indian Rope Trick”, Bharatiya Samajik Chintan 7 (4) (New Series) (2009) pp. 265–269, at http://ckraju.net/papers/MathEducation2RopeTrick.pdf. 27 C. K. Raju, “Time: What is it That it can be Measured” Science&Education, 15(6), 2006, pp. 537–551. 28 C. K. Raju, “Teaching mathematics with a different philosophy. 1: Formal mathematics as biased metaphysics” Science and Culture, 77 (7-8), 2011, pp. 275-80. 29 Briefly, a discontinuous function is not differentiable on undergraduate calculus, but is differentiable on the Schwartz theory of distributions. But neither definition can be directly used for the nonlinear differential equations of physics, in the presence of shocks. The better way out is to appeal to the empirical, rather than Western mathematical authority. See, “Renormalization and shocks”, appendix to Cultural Foundations of Mathematics, cited above. An earlier paper from the days when I still believed in formal math is “Distributional Matter Tensors in Relativity”, Proceedings of the 5th Marcel Grossmann Meeting on General Relativity, ed. D. Blair and M. J. Buckingham, World Scientific, Singapore, 1989, pp. 421–23. http://arxiv.org/pdf/0804.1998v1. 30 C. K. Raju, “Teaching mathematics with a different philosophy. 1: Formal mathematics as biased metaphysics” Science and Culture, 77 (7-8), 2011, pp. 275-80. 33 C. K. Raju, “Computers, mathematics education, and the alternative epistemology of the calculus in the Yuktibhasa”, Philosophy East and West, 51(3) (2001) pp. 325-61. Available from http://ckraju.net/papers/Hawaii.pdf. 34 See my article on “Logic” in the Springer Encyclopedia of Non-Western Science, Technology and Medicine, 2008. Draft at http://ckraju.net/papers/Nonwestern-logic.pdf. 35 Thomas Aquinas, Summa Theologica, First part of the Second Part, 91,1. 36 C. K. Raju, “Islam and science”, Indian Journal of Secularism, 15(2), 2011, pp. 14-29. 37 See the presentation at http://ckraju.net/papers/decolonising.pdf, and the video at http://vimeo.com/26506961. My talk is the first half hour. 38 C. K. Raju, “Thermodynamic time” Physics Education (India) 9, 1992, pp.44-62. 39 C. K. Raju, “Einstein’s time” chp. 3b, in Time: Towards a Consistent Theory, cited above, and article in Science and Education, cited above. 40 C. K. Raju, “The Michelson-Morley Experiment”, Physics Education 8, 1991, pp. 193-200. 41 The reference on “Einstein’s time” above has numerous quotes from Poincare. This is also explained for the layperson in The Eleven Pictures of Time, cited above. 42 The suggested curriculum change counters Einstein’s mistake, explained in “Electromagnetic time”, chp. 5b in Time: Towards a Consistent Theory, cited above. http://arxiv.org/pdf/0808.0767v1. Difficulties in this matter, which arose during the Groningen debate are clarified in “The electrodynamic 2-body problem…”, cited above. http://arxiv.org/pdf/quant-ph/0511235v1. There is an online explanation of some of this for the layperson at http://ckraju.net/misc/Einstein.html.